On April 17, 2013 the bipartisan Senate “Gang of 8” introduced the Border Security, Economic Opportunity and Immigration Modernization Act of 2013 (S.744). Given that children of immigrants now comprise 25 percent of the U.S. child population and are uniquely impacted by U.S. immigration policies, it is critical that immigration reform addresses the specific needs of children. 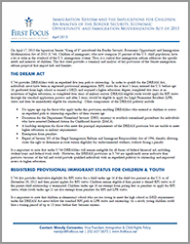 In response to the bill, First Focus released this summary and analysis of key provisions of S.744 that impact kids and families.